Stainless steel urinal troughs are a great option for public restrooms. Whether your facility is a school, sports stadium, medical facility, industrial factory or any other location a trough is a great option. These urinals help to facilitate several users at once and can offer a better hygiene option with less flushing for water saving value as well. 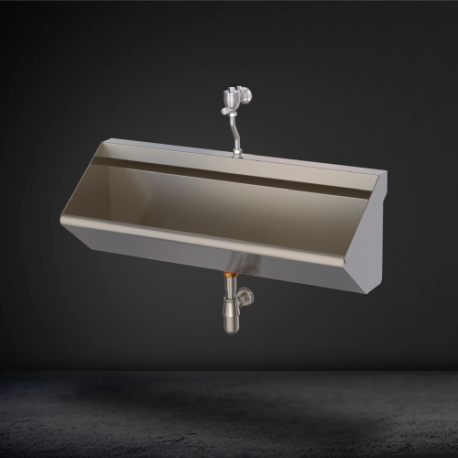 When it comes to durability, efficiency and a long lasting option, stainless steel troughs are the way to go. 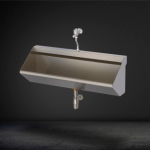 The best benefit of installing a stainless steel urinal trough for your public restrooms is the industrial strength. You won’t have to replace broken porcelain fixtures any more. The wall mounted trough is a seamless welded piece and is manufactured for durability. 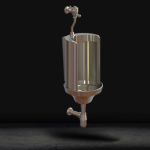 The urinal troughs that are offered at Stainless American Designs require much less maintenance than models made from other metals. It is best to only clean these urinals with water and a plastic brush to maintain the appearance. This can help you to cut down on cleaning supply costs greatly. Dish soap can be used as well as it is not corrosive to metal like chlorine and other harsh chemicals. When you opt for a stainless steel urinal trough you are purchasing a solid metal urinal with metal parts. The design and quality materials are sure to last longer than porcelain counterparts. The included hardware of the time delay flush valve, urinal strainer, p-trap and screws and anchors are all metal and included with the product. 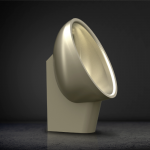 There are several designs and sizes to choose from to match the needs of your public restrooms. These troughs are great for schools, medical facilities, industrial buildings and more. With more people using one urinal and flushing less you can be sure to cut down on water usage. Stainless steel urinals in general offer less water usage than porcelain restroom options. This is a great option for companies looking for a greener more environmentally friendly option. If you are interested in stainless steel options for your public restrooms be sure to contact us. We have a wide variety of options for troughs. We can also offer options for your entire restroom to be outfitted in stainless steel. Be sure to call us today for more info. One of our experts will be happy to answer your questions. •Tagged benefits of a trough urinal, long lasting materials and design for urinals, options for commercial urinals, options for urinals, stainless steel urinals, trough urinals and water usage, urinal trough, urinals•Leave a Comment on Why Are Stainless Steel Urinal Troughs Better?